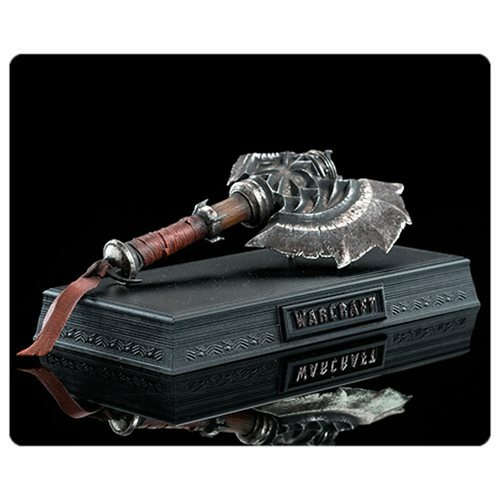 Shopping for Warcraft Prop Replicas? The fearsome weapon favored by Durotan, noble Chieftain of the Frostwolf Clan and lead protagonist for the Horde, is memorialized in this sensational polyresin Warcraft Durotan's Axe 1:6 Scale Prop Replica from Weta Workshop and the 2016 adventure/fantasy movie Warcraft. It sits on a Warcraft-themed base. Measures approximately 8-inches wide x 4-inches tall x 4-inches deep. For ages 14 and up.